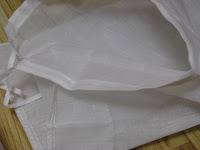 I've been looking for a nut-milk bag forever. There are lots to purchase online, but the shipping is 2-3X more than the cost of the product! So needless to say I never bought one online. And they just don't seem to be sold in any of the health food stores around here. Then YESTERDAY, I was at New City Supermarket, looking for seaweed snacks (more on that later!) and out of the corner of my eye, I see little packages hanging with what looked like mesh-type-stuff in it. I looked closer... Read the label... YES!!! It's a fine-mesh bag, used for straining stuff like when making soups. AND it's $1.29!!!!! I feel like it's my birthday and Christmas all wrapped up in one! I haven't tried it out yet--I put the almonds for almond milk to soak last night, 'cause they make much nicer milk if they're soaked first. But I have FAITH!! 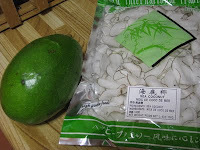 I bought a few things at that supermarket which I've never bought or in one case heard of before, to see what they are: An avocado greener than the fields of Ireland, which I'm hoping I'll be able to tell when it's ripe; something called "sea coconut" and seaweed snacks! The avocado I'm a bit nervous about, but so long as you can tell it's read in the same way that you can for other avocados, then I'll be OK. I want to make nori rolls this week, so I will need it. The sea coconut I looked up online. Apparently it's used in brothy chicken soups. Well OK then! It will keep in my pantry until the cool weather comes--'cause there's no WAY I'm making soup when it's still so hot outside! Nope, not gonna happen. * 1-2 tbsp flax seeds, soaked in 1 tbsp water or almond milk, long enough for them to become a bit gelatinous. Throw the flax seeds into a food processor or high-powered blender, along with the cinnamon and vanilla. Pulse to combine well. Add the apple, and pulse again until desired consistency. Make sure not to pulse until it's super smooth--the consistency, at least to my palate, is a bit slimy. It should still have very small (or larger if you like) pieces of apple. 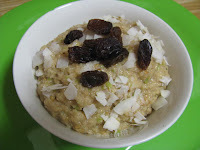 Top with raisins, nuts, and coconut, if you like. Note: You won't need any sweetener (honey, agave) if you pick an apple which you like. If you like tart apples, then make this recipe with one of those. If you like a bit of tart, then pick one like that. If you like sweet apples, ditto. I like mine either just a little tart, or sweet, so I picked sweet apples, and then just added a tiny bit of lemon juice to balance out the sweetness. You can make this recipe with pears too! Or mix of apples and pears! Yum! !